This site is intended for healthcare professionals in the United States. Members of the general public may review the content on this site, but it is not intended for that audience. The information below provides a general overview of the potential health benefits/uses, mechanisms of action, and safety of probiotics. The science behind these benefits is still emerging and appears to be strain specific. 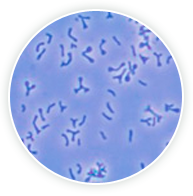 Though Bifantis is a probiotic, it has not been studied in many of these areas, and as such there is no data to show that it can provide all these benefits. For information particular to Bifantis, see About Bifantis. For additional information on potential health benefits of certain probiotics, see Professional Resources and Probiotic Scientific Data. Induce hyporesponsiveness to food antigens. Digest food and compete for nutrients. Probiotics are well tolerated. There are typically few or no adverse effects.7 Side effects, if they occur, tend to be mild and self-limiting. In general, the most common side effects appear to be gas, bloating, and abdominal discomfort.4,7,8 In placebo-controlled clinical studies, there was no difference in side effects between Bifantis and placebo. Although Bifantis has not been studied in people who are severely ill or immunocompromised, a review of available probiotic data with the use of supplements containing Bifidobacterium does not suggest cause for concern. As with other dietary changes, patients who are severely ill or immunocompromised should be evaluated by their healthcare professional to determine if a probiotic is right for them. More is not necessarily better: The amount of probiotics is usually expressed as the number of colony forming units (CFUs), or the number of viable microbes, per serving. The required amount of probiotics varies greatly for different strains and the specific health effect under investigation – it depends on evaluation in clinical studies and the amount that has been shown to be effective. The fact is that more is not necessarily better; different strains have been shown to be effective at different amounts. There is no minimum or maximum number of bacteria that must be ingested to obtain a beneficial effect. The benefits of probiotics are strain specific, and the required amount varies for different strains and the specific health effect.2,3,6,9 Similarly a probiotic product with multiple strains is not necessarily better than a probiotic product with a single strain. Again it depends on the desired benefit and if the single strain and/or multiple strain probiotic has been shown to be effective for that specific health benefit. Reference to institutions and agencies is provided for informational purposes only and does not suggest an endorsement or approval of Bifantis®. Joint FAO/WHO Expert Consultation on Evaluation of Health and Nutritional Properties of Probiotics in Food Including Powder Milk with Live Lactic Acid Bacteria. Cordoba, Argentina, 2001 Oct 1-4.Available at: www.who.int/foodsafety/publications/fs_management/en/probiotics.pdf. World Gastroenterology Organisation Global Guidelines. Probiotics and prebiotics. 2011 October. Available at: www.worldgastroenterology.org/probiotics-prebiotics.html. The International Scientific Association for Probiotics and Prebiotics. Probiotics: A Consumer Guide for Making Smart Choices Available at: http://www.isapp.net/docs/Consumer_Guidelines-probiotic.pdf. National Center for Complementary and Alternative Medicine. National Institutes of Health. Get the facts. Oral probiotics: An introduction. Updated November 2011. Available at: nccam.nih.gov/health/probiotics. Joint FAO/WHO Working Group on Drafting Guidelines for the Evaluation of Probiotics in Food. London, Ontario, Canada. 2002 Apr 30—May 1. Available at: www.who.int/foodsafety/publications/fs_management/en/probiotics.pdf. Douglas LC, Sanders ME. Probiotics and prebiotics in dietetics practice. J Am Diet Assoc 2008 Mar;108(3):510-21. Kligler B, Cohrssen A. Probiotics. Am Fam Phys 2008 Nov;78(9):1073-8. The American Gastroenterological Association. AGA Institute. Probiotics. What they are and what they can do for you. Available at: http://www.gastro.org/patient-center/diet-medications/probiotics. Sanders ME. How do we know when something called "probiotic" is really a probiotic? A guideline for consumers and health care professionals. Funct Food Rev. 2009;1:3-12. © 2019 Procter & Gamble. All rights reserved. All statements valid only in the U.S.